To celebrate my birthday (December 11th), Ed and I took a quick trip down to Leavenworth, Washington. When we arrived, the streets were jam-packed with tourists and locals there for the Christmas Lighting Festival being held later in the day. As it was darned cold and somewhat windy, we took frequent advantage of what Ed called the ‘people warmers‘ which were placed at strategic intervals along Main Street. Whenever we stopped at one, we engaged in polite chat with others who were also crowding around the heaters. Well, so much for ‘polite chat'! All of a sudden, we were talking with almost everyone we passed. Little kids stared and pointed; while adults smiled, laughed and called out ‘love the hat!' and ‘where'd you get it?'. Of course, there was immediate bonding with the many others who were also wearing weird and wonderful hats. Just as my hat set me apart from the crowd and made others more inclined to stop and talk, you need to do the same with your Internet business and website. In other words, your site has to be unique, or as I like to call it, YOU-nique. And the best (and easiest) way to do that is just to be yourself. even if I hadn't seen you, I would have known it was you, just by listening to you talk! Awesome… that's exactly what you want to hear! So, if you spend time agonizing about how to write everything ‘just perfectly'… relax. Tell it to a friend. Then write it down just as you would say it. By doing that exercise, you will come through in your writing, and your readers will connect with the real you which is the person they really want to know. If you want to speak and write at the same time, check out Dragon NaturallySpeaking 10 Standard . I'm on my third edition of the software, and the latest version (10) is a vast improvement over earlier editions. Although you still have to ‘train' the software to recognize to your voice and it's nuances, much less training is involved with version 9. I bought it originally when I was having trouble typing because of the pain in my wrists (brought on by too much typing), but kept using even after they got better. My question to you is… how much time does it take you to write your average blog post or article. Do you find it fun & easy or more like pulling teeth — and why? Did you find this post informative and useful? If so, please share it with others! If you have a comment, question or suggestion, please leave a comment below! Many happy returns. You didn’t say what birthday,….I guess you will keep it under your hat….. Happy birthday to you, happy birthday to you, happy birthday dear Ros….., happy birthday to you!!!!!!! I’ve been to Leavenworth before and it was a cool place. I recall stopping at this cafe and ordering “hot” potato salad with the impression that it was going to be “spicy” hot, but it came out “stove” hot and nearly made me sick. Nasty! Anyway, I love the hat! Thanks for all you do Ros. Happy Birthday and May There Be Many More Years Ahead of You! Cute hat…I prefer earmuffs myself! As to writing anything or to anybody, it can prove to be challenging since after hearing from me a few times…They want to be taken off my mailing list…Go figure! Thanks for all that you share with us. You are doing a great job. I’m a hat person myself–so I love that hat! happy birthday Ros. I have to agree with you about Dragon Naturally speaking. I would recommend it espcially if like me you are a four finger typist who looks at the keyboard not the screen. I use it and once its up to speed with your accent it’s fantastic. Tip when training it don’t speak slowly – speak at your normal speed or you have do do it all over again. Great to know I share the same birthday week/month with a lovely person like you. My own birthday ( & my twin sister’s as well) was on the 9th of Dec). Cheers & many happy “superaffiliate” returns now & always! I to love your hat, you look great I am sure that the cold wasn’t too bad. Next time if you visit to Bali (Paradise Island), Indonesia, email me, I’ll really like to meet you and host you as my precious guest. Wish you always be blessed..
Let the Heaven besto the best BLESSINGS…..upon U for all the wonderful things you are doing…. Happy Birthday Rosalind! And I wish you many happy returns. I’m a newby and I’m taking my first lead from you in finding a fun hat for my next birthday. 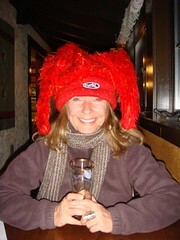 Of course your “red hat” may become a popular request for all future appearances. So keep it handy. Thank you for the great “birthday” opportunity today. What a generous way to celebrate your special day. I’ve just purchased the Super Affiliate Handbook and I look forward to begin my journey, in learning how to become a successful Affiliate Marketer. Sending you a virtual “tiara” for your birthday! Hope it was a great day! PS. It was wonderful meeting you in Vegas. I am still pouring over the great ideas and tips you shared and putting them to work! Happy Birthday Rosalind! Wish you the best. I agree with your idea of being you-nique. as far as your question about blogging, it usually takes less than an hour to make a post to my blog but several days to get the motivation to do itl. Oh well, another New Years Resolution is in order. Happy Birthday! You’re looking good with that hat. Also you talked me into buying your book. Manymore happy returns and have a great Christmas. I owe you a beer next time you’re in Kelowna, but don’t bring that hat 🙂 OMG. and Happy Holidays to you and yours….. I have enjoyed reading your newsletter for a long time. Cute Hat!! Happy Birthday and I wish you many more!! Hope you had a great day today. You sure do deserve it. You are one of the hardest working ladies I have heard of on the internet. Keep going Ros. Also please take a Birthday look at my Beautiful web sites and Booking Engines when you book your travel. Our Company is very competitive on prices and ALL trips and Vacations. You will save money on my booking engines. Stop and smell the Roses in your Garden. Many Happy Returns of the Day and Happy Holidays. Happy Birthday! Have fun & stay warm. We wish you a safe and happy winter break. I read your post and enjoyed your perspective. What a great day to have a birthday. And what a great gal to have a birthday today! Thanks for reminder and great post.